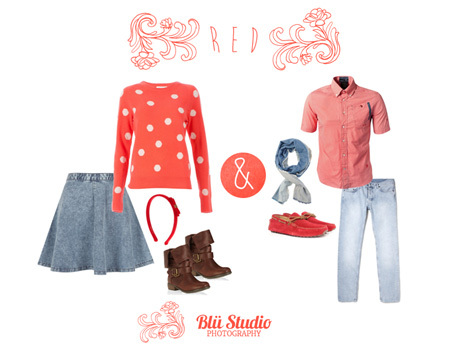 We get asked a lot by our clients “What should we wear for our engagement/couples session?”. It’s a good question. The point of this post however is not to go over what should and shouldn’t be worn by couples. It is rather, a look at how you can pick outfits, based on colour, that complement each other and add an extra level of professionalism to your final photos. There’s just something about a couple in complementary clothing that adds a real ‘wow factor’ to the final images from their engagement or couples session. Nothing says fresh and new quite like the colour green! 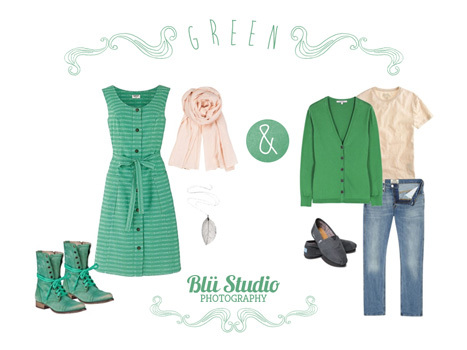 Green comes in a wide array of shades, ranging from a yellowish, pea-like hue all the way to turquoise! Green looks beautiful combined with earth tones, and therefore makes a wonderful choice for outdoor shoots and backdrops of wood and stone. Even small accents of green such as jewelry, scarves, or shoes, look wonderful with whites and tans. Indigo – or deep blue – is a rich, exceedingly popular colour which looks beautiful in almost any setting. 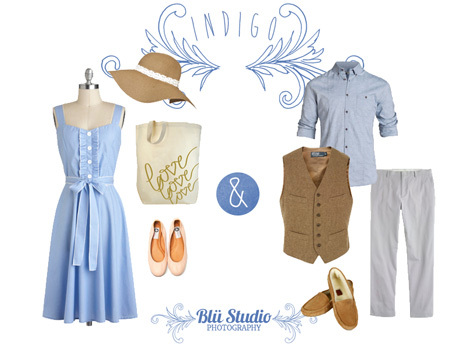 Outfits with blue elements create a sense of calm and quiet - perfect for a more introverted couple or natural backdrops. Blue can be dressed up or down to fit your tastes, and can be used either as a main colour or for accenting in your outfits. Orange is a tangy, optimistic colour that demands attention! Strong, joyful, and happy, adding orange to your engagement session is always a hit on camera. 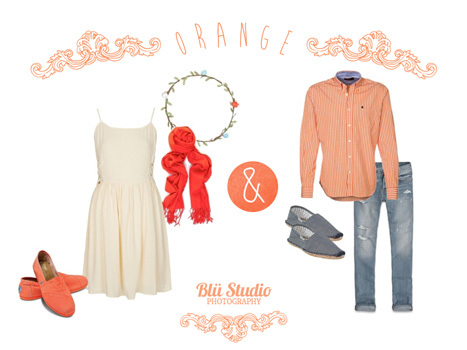 Couples with a more extroverted nature might enjoy orange-themed outfits. Orange also looks wonderful in urban settings, such as against concrete, brick, and stone. Red is one of, if not the, strongest of colours in the rainbow. A symbol of power, passion, blood, and love, red is a bold and striking colour for your engagement session. Since red is truly a brilliant, attention-grabbing colour, we recommend peppering your outfit with red accents instead of making red the main colour for all garments. Pairing red with denim or darker neutral tones makes for striking engagement images that create lasting impressions on your wall. In ancient times, the creation of purple dye was an incredibly lengthy, expensive process. Purple garments became a symbol of wealth and nobility, even royalty; and were sought after world-round. 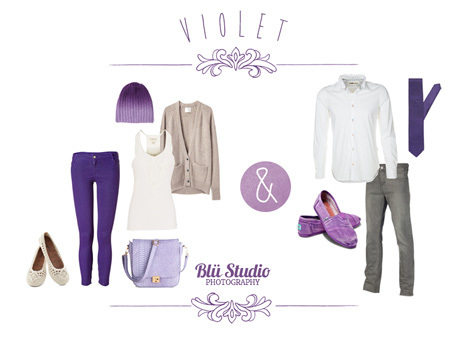 Although violet is now far easier to come by, the colour is still associated with its royal roots. A violet-themed engagement outfit exudes playful sophistication and looks great on camera! Small accents of purple, such as scarves and accessories, can also liven up an otherwise muted palette! Ah, yellow! The color of happiness, of light and sunshine. 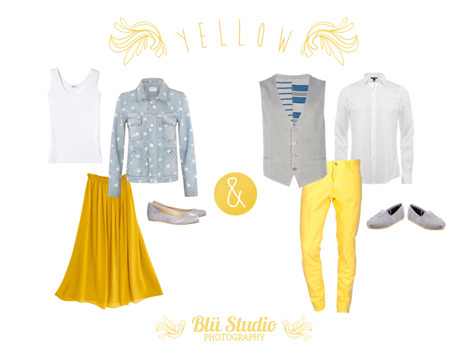 Yellow is a wonderful colour to wear in outdoor, buttery natural-light shoots, and looks amazing on camera! Although yellow can be difficult for some to wear because of its tendency to wash out skin tones, patterns with yellow or a single yellow garment in an otherwise neutral palette adds wonders to your images. Adding yellow florals, jewelry, or accents also helps to make your photos go "POP!". We love yellow! Paul is actually from England and moved out here in 1999. You may here some rather strange sounding words coming from his mouth but don't worry, nobody else understands them either. We have been taking pictures for a long time. Let's just say that our first cameras had the words Fisher and Price printed on them somewhere. We've been shooting weddings full time since about 2007 and before that we were into the whole landscape thing. You can see some of those images if you follow us on Instagram.